China and the United States produce the largest CO2 emissions in the world. But do you know who comes in 3rd? No, it’s not the E.U., Brazil or Australia. It’s not India or the state of Texas. It’s slavery. Earlier this week I heard from Kevin Bales – author and co-founder of Free the Slaves – about how slavery and environmental degradation go hand-in-hand. Bales is writing a book on the subject, and according to his research, the problem is cyclical: when you destroy the environment, the people who live in the area become desperate and more vulnerable to deceptive tactics from slave owners. 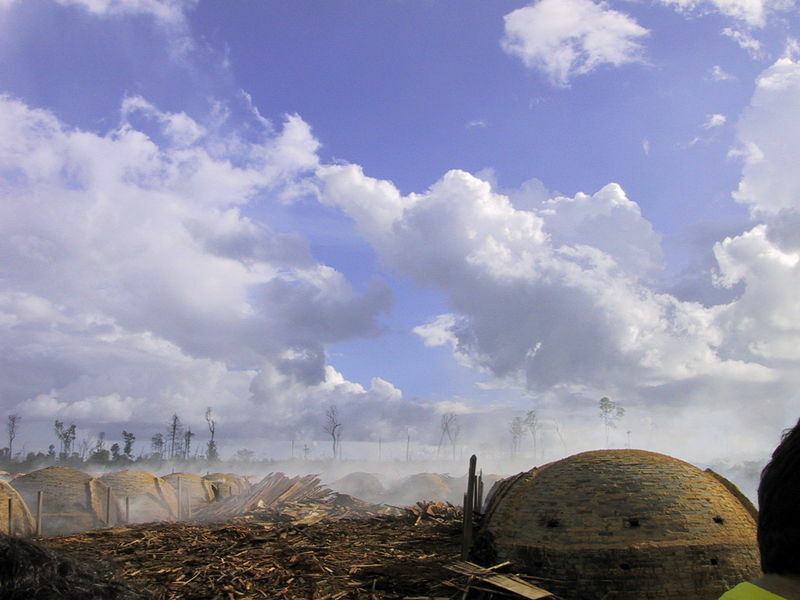 Once enslaved, they’re forced to ruin even more of the environment. From deforestation in the Amazon to slave-run quarries on national park land, industries dependent on slave labor produce a huge carbon footprint: roughly 4.28 billion tons. The equivalent carbon credit is $68.5 billion. What’s worse – many of the smokestacks in India’s brick kilns burn old tires, used motor oil, and computer scraps for fuel. For the slaves working these kilns and the communities surrounding them, the carcinogenic risks are devastating and unavoidable. In the Democratic Republic of Congo, where the human toll of decades of war has received some international attention, activists have labeled the environmental situation an ecocide. Everything in the mining regions is at risk: animals are endangered or dying off, the forests have disappeared, and huge holes filled with slaves are left in their place. In Asia, where deforestation threatens mangrove populations crucial to protecting coastlines and filtering CO2, many slave children report friends being eaten by tigers as their slave owners force them to move deeper and deeper into the territories of endangered and on-edge wildlife. In South America, reports of murder and slave labor follow a perfect arc directly in front of deforestation efforts moving toward the Amazon. In other words, as industries move in closer and closer to the Amazon, clearing away all the trees in their path, they do so riding a wave of death and forced labor that make their expansion efforts possible. Environmental efforts to curb the destruction have not worked well. After all, criminals run these businesses – and criminals don’t care about the EPA or the Kyoto Protocol. It’s an economic issue for them, as even the slaveholders often come from destitute regions willing to exploit their own land for the sake of desperately needed short-term financial benefit. No, by its very definition, criminal activity won’t stop because of regulations. Enslaved people need law enforcement to find and prosecute wrongdoers. They need more anti-trafficking efforts that help free and reintegrate former slaves. People who don’t believe in man-made climate change or global warming but who care about personal freedom and the right to life may need to become environmentalists. People who care about endangered species and preserving the rainforest may need to become human rights activists. The question is, are we willing to work with people who disagree with us on one thing in order to make everything better? Is the possibility of liberty around the world and a stable, well-used ecosystem worth crossing party lines and trying, for once, to stop the one thing we can all agree on? Live in DC and want to hear from people like Kevin Bales or get more involved in the contemporary abolition movement? Contact me! Explore these resources from Free the Slaves to learn more. There are alternatives to the destructive practices commonly used to access our world’s resources. Mining and farming co-ops, for example, pay farmers a decent wage and free them from the tyranny of someone else’s ownership. They encourage efficient use of the land and, in the case of mining, often finish their projects by returning the area back to what it was beforehand. As large, community-supported groups, they can also protect land owners from thugs. Free the Slaves and other anti-trafficking groups work directly with some of these co-ops.